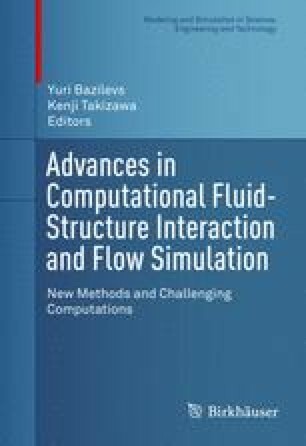 This chapter is on fluid–structure interaction (FSI) analysis of blood flow in the thoracic aorta. The FSI is handled with the Sequentially Coupled Arterial FSI technique. We focus on the relationship between the aorta centerline geometry and the wall shear stress (WSS) distribution. The model centerlines are extracted from the CT scans, and we assume a constant diameter for the artery segment. Then, torsion-free model geometries are generated by projecting the original centerline to its averaged plane of curvature. The WSS distributions for the original and projected geometries are compared to examine the influence of the torsion. This work was supported by the JST-CREST Mathematics program. The authors thank Dr. Ryo Torii (University College London) for providing the observed data for the pressure profile in the aorta.